Mamet has always been concerned with primal masculinity...The test of these men is twofold: can they survive the wilderness, and can they survive each other? 117 min. 20th Century Fox. Director: Lee Tamahori. Cast: Anthony Hopkins, Alec Baldwin, Elle Macpherson, Harold Perrineau Jr, L.Q. Jones. When in 1999, Pulitzer Prize-winning playwright and screenwriter David Mamet launched his own clothing line—The Joseph Morse Company label through Banana Republic outlets—those who had being paying attention to Mamet's writing weren't terribly surprised. Mamet has long expressed an appreciation for the vintage acoutrements of hunting, including a dying breed of masculinity. Mamet's screenplay for 1997's The Edge would seem to reflect a fictional fulfillment of the author's own wishes, with its well-heeled, bookish protagonist, who—after having been thrust into the wild—confesses, "For all my life, I've wanted to do something that was unequivocal." Mamet has always been concerned with primal masculinity, usually depicting it at its most ugly and destructive. Mamet's plays tend to focus on the sharky dark side of the equation, but films, of necessity, have led Mamet to give equal time to the virtues of primal masculinity, tempered by society but waiting, beneath the surface, for rediscovery. The Edge (originally titled "Bookworm") makes an appealing hero of an idle billionaire. Charles Morse (Anthony Hopkins) is bored with his comfortable existence and quietly distressed at the creeping suspicion that his younger, fashion-model model wife Mickey (Elle Macpherson) loves his money but seeks sexual satisfaction elsewhere—in particular with a photographer named Bob (Alec Baldwin, amusingly following up on his beloved, nasty cameo in Mamet's Glengarry Glen Ross). For his part, Bob cultivates an ambiguous friendliness, telling Charles, ''Never knowing who your friends are, never knowing what people value you for. Must be tough.'' "Never feel sorry for a man who owns a plane," Charles replies. Mamet effectively sets the stage by assembling his characters at a hunting lodge a stone's throw from the Alaskan wilderness, ostensibly as an opportunity for Bob to shoot Mickey for a going-native-themed spread, but partly as a retreat from civilization. Charles is a font of arcane knowledge, much of it pertinent to tribal cultures and survivalism. When Charles, Bob and Bob's assistant Stephen (Harold Perrineau) find themselves off the grid after surviving a seaplane crash (miles from where they were supposed to be), it's time for Charles to put up or shut up, employing his book-knowledge to save their lives. Most people lost in the wilds, they die of shame," Charles tells his fellows, not so reassuringly. "Because they didn't do the one thing that would save their lives...Thinking." As embodied by the ideally cast Hopkins, Charles seems likely to survive because of his resolute control, though before his adventure is over, he will give over at least temporarily to man's kill-or-be-killed nature. Bob's macho bluster turns out to be mostly sizzle and no steak, and Charles invites tension by thinking aloud that Bob and Mickey intend to knock him off and live on his billions. Whether or not Bob can be trusted adds a layer of tension to an already dire situation, as the three men attempt to elude a hungry metaphor—err, bear (Hopkins' Legends of the Fall co-star Bart the Bear)—that has caught their scent. The test of these men is twofold: can they survive the wilderness, and can they survive each other? Through it all, Mamet spills plenty of his trademark witty dialogue; there's also a strikingly unusual, purely Mametian focus on objects, some of which become key to survival (a knife, a flare, a paper clip turned compass needle) and others that speak loudly as totems of cultural significance (a Native American oar on display in the lodge) or personal meaning to the characters (a gift wristwatch). 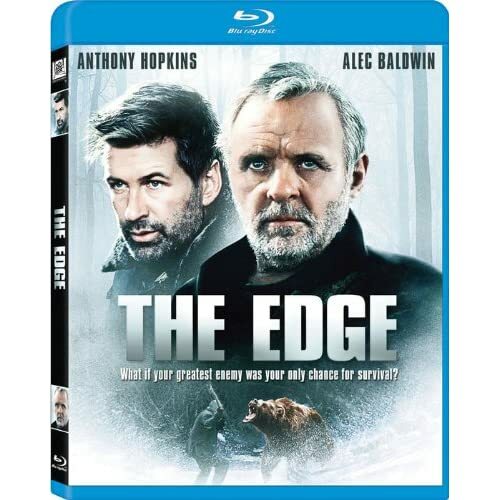 The Edge has been largely neglected, best remembered for its troubled road to the screen (the studio's clash with Baldwin, pastiched in Art Linson's What Just Happened; Hopkins nearly succumbing to pneumonia). Despite it all, director Lee Tamahori survived, turning in a satisfying adventure drama by serving the material without unnecessary flourishes: he knows he has Mamet, Hopkins, Baldwin, Bart and the elements, and he wisely chooses to stay out of the way. The result is one of Hollywood's most considered wilderness tales. 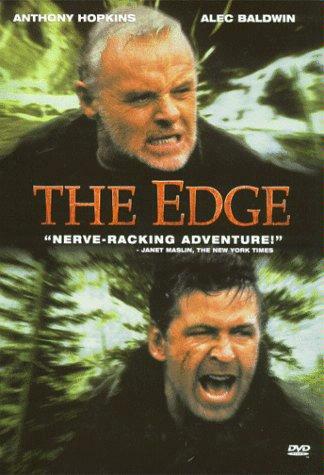 Other than a bit of telecine wobble at the outset, Fox's hi-def Blu-ray transfer of The Edge is very impressive. It's a pleasure to see this catalog title getting a re-release so soon, and particularly with it looking so sensational. The source is clean, and the film grain light and natural. Colors are bold and contrast and black level strong, abetting a pleasingly sharp image, and the film's emphasis on location work often lends a convincing dimensionality less common in studio-lit scenes. Another pleasant surprise comes in the form of the disc's robust DTS-HD Master Audio 5.1 surround mix; this isn't a movie with gunfire and car chases, mind you, but the mix offers thoughtful separation for outdoor ambience as well as delivering Mamet's dialogue with excellent clarity. Sadly, the sole extra on the disc is the film's "Theatrical Trailer" (2:27, HD), but the film does pretty well speak for itself. All site content © 2000-2019 Peter Canavese. Page generated at 04/24/2019 10:32:42AM.